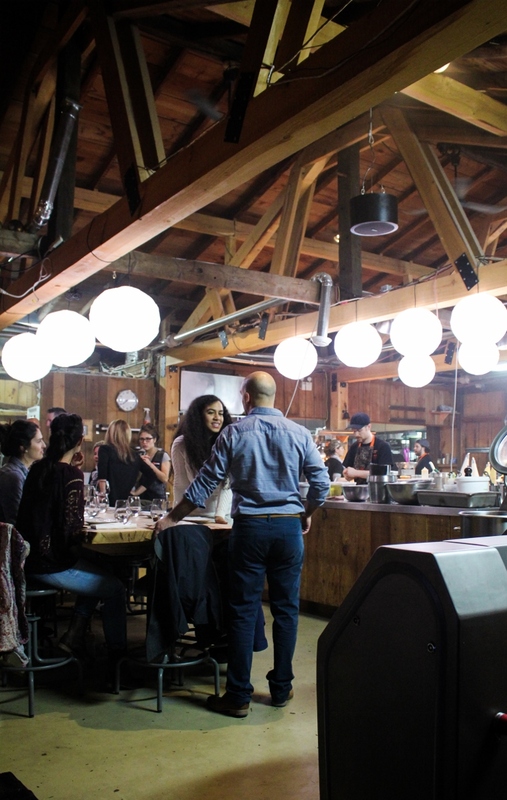 Last April, Trevor and I made the drive up to Montreal just to partake in the sugar shack dinner at Au Pied de Cochon, Martin Picard’s infamous and lively, pork-loving restaurant. We’d been waiting for over two years to go – reservations open December 1st at midnight, and over 2,000 people submitted requests in the first five minutes – and it 100% lived up to our (very high) expectations. 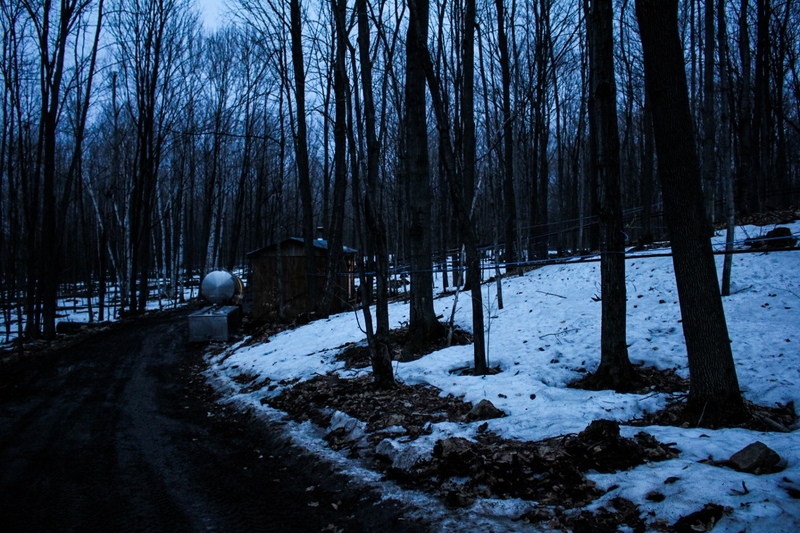 I wanted to write about it right away, but by the time we were back and I’d processed what I wanted to say, we were well into May, and it just seemed like an inappropriate time to share maple-syrup laden pork and duck dishes. So I waited until now, when heavy winter dishes are once again on the menu (and now this post can serve as a more timely reminder to those of you who might want to snag a reservation!). As I flip through the pictures from that trip, I’m wishing now that I took better notes for you. I’m left mostly with a memory of warm yellow light filling a crowded cabin-style room, anticipation and excitement building with every course. 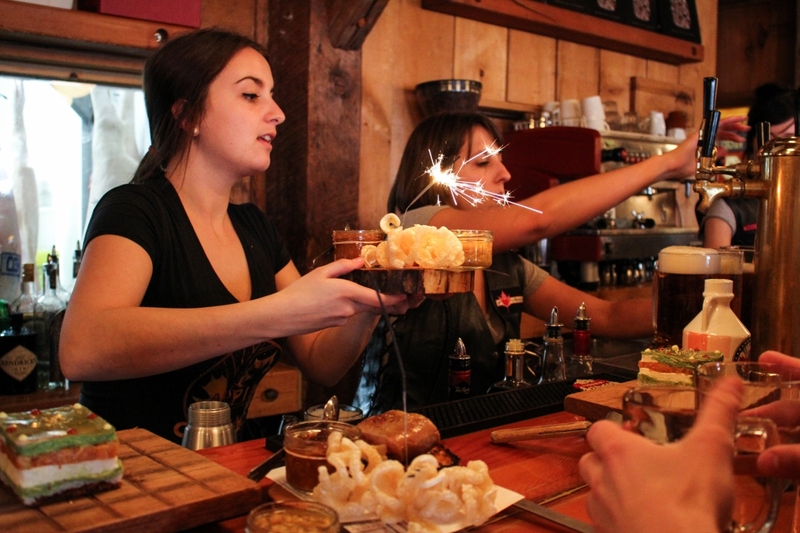 A loud and convivial atmosphere of friends and strangers enjoying food that is completely over-the-top in more ways than one. A giant block of cheddar cheese being wheeled around the room on a trolley cart, the servers tossing steaming hot blood-and-ink fettucine in the hollowed out center to coat the noodles with melted cheese. 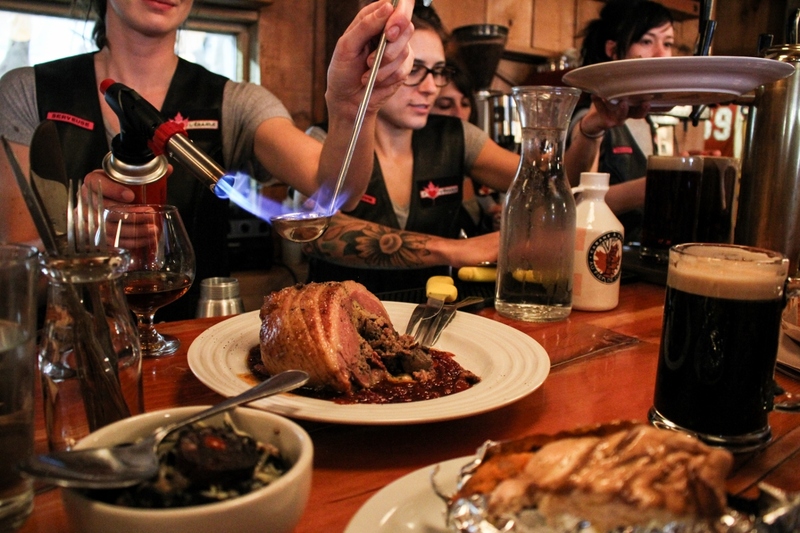 A cognac-doused duck-stuffed-duck being placed in front of Trevor and me, flaming, the whole duck just for the two of us. 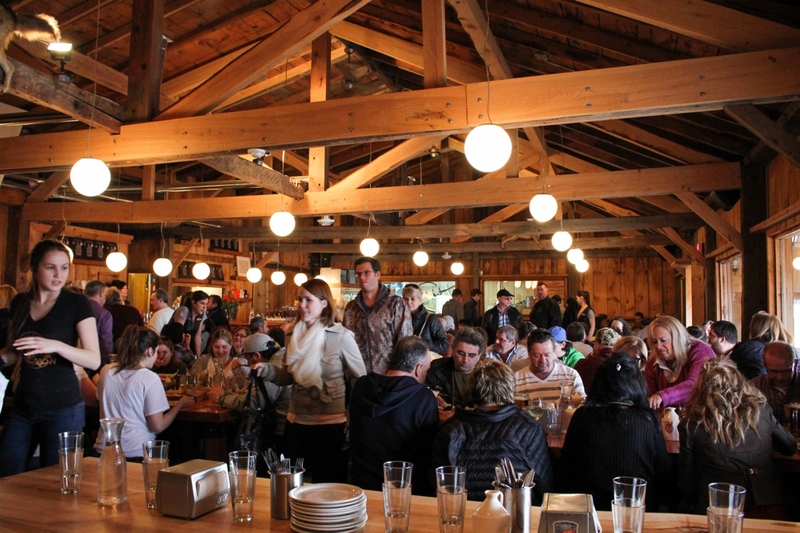 Sitting at the bar, watching the waitresses pour mug after mug of maple beer. 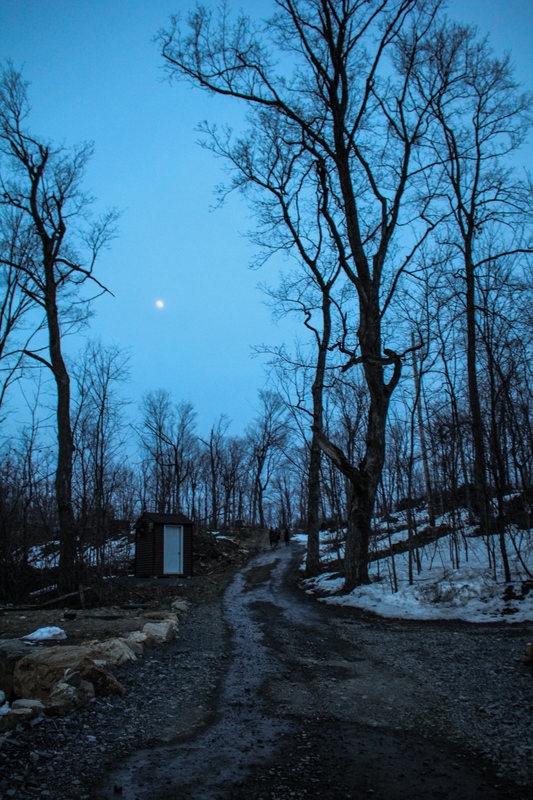 Walking through the still-cold, still-muddy woods at twilight, enjoying the contrast between the still woods and the jolly feast inside. It was a wonderful experience: lively and joyful and a bit otherwordly, like something out of a book or a play. I’d go back in a heartbeat. I do have a good list of what we were served, course by course. First, the drinks: a hefty mug of maple beer for Trevor, and a series of just-sweet-enough maple daiquiris for me. The appetizer course had three meal-sized components: a huge piece of maple foie-gras served with duck fat toast; a “sushi cake,” made with layers of rice, salmon tartare, and wasabi avocado mash; and pork cracklings served with little pots of maple-soaked scrambled eggs and maple baked beans. Next up was sturgeon in mussel and bacon sauce, followed quickly by an omelet of sorts, baked into a skillet with potato, beef, tomato, and a parmesan bread crust. Then one of my favorites, a make-it-yourself sandwich with duck fat fried dough as the bread, mustard, and inch-thick slices of juicy ham unlike any ham I’d every had before. Perhaps the most impressive course was the afore-mentioned duck, fed on maple syrup then stuffed, drenched, doused with cognac, and flambeed. This was served with baked sweet potatoes topped with maple-meringue, a dish I’ve recreated for you here. The last savory course was the blood and ink fettucine with blood sausage and cheddar cheese, and then we moved on to the desserts. 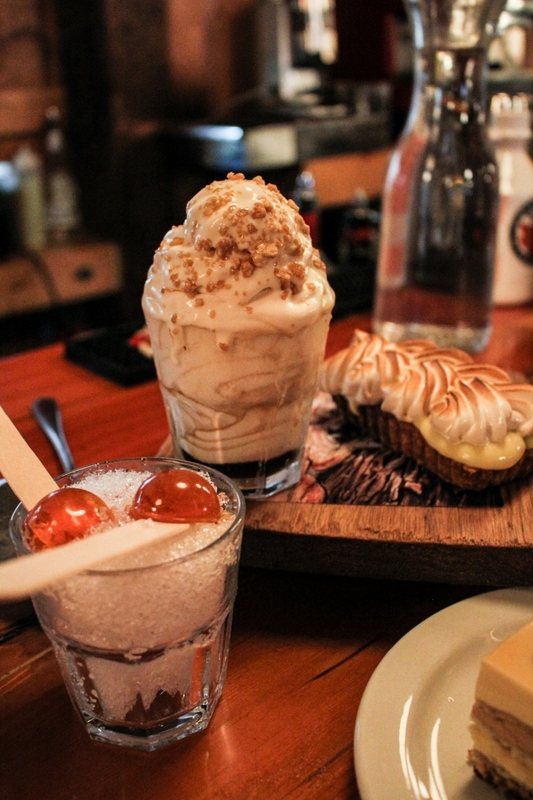 Served all together, the desserts were a banana cream pie with maple meringue, maple taffy on ice, a mocha maple cake, and a maple frozen yogurt with maple sugar and whiskey. There was an absurd amount of food served, and all of it was incredibly rich and delicious – easily the most lavish meal I’ve ever been a part of. The standouts for me were the maple daiquiris, the ham sandwich, and the maple frozen yogurt, which had an incredible tang to it. 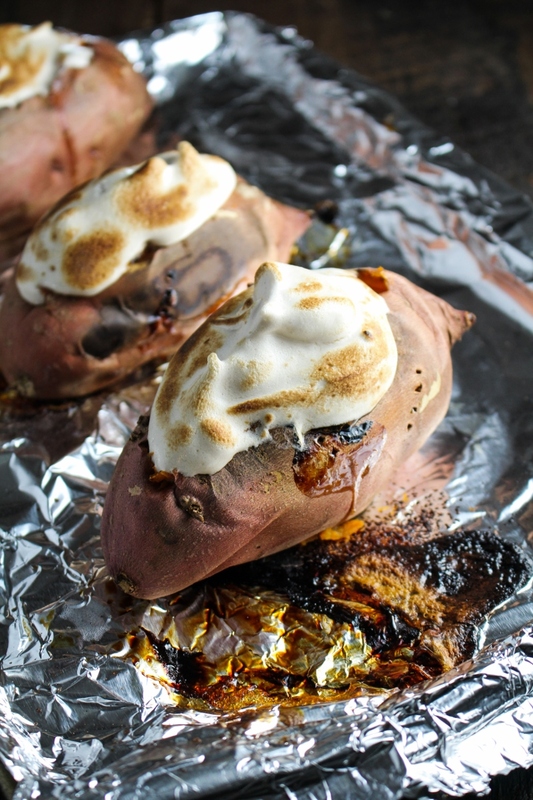 We may try to recreate all of these dishes at home at some point, but the easiest, and the most appropriate for this month, were the simple but clever baked sweet potatoes with maple meringue topping. 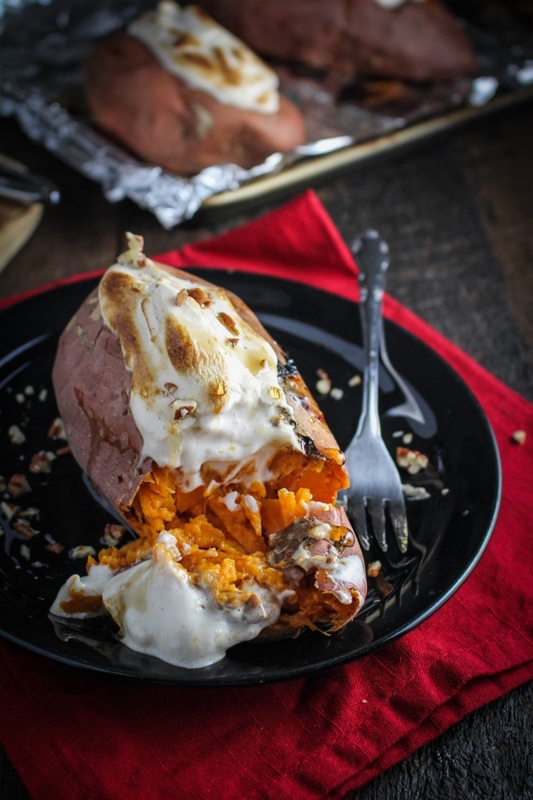 Although I know that realistically, anyone who is cooking Thanksgiving dinner tomorrow has had their menu set for weeks and is not looking for last minute additions to their very long to-do list, these baked sweet potatoes would theoretically be a great addition to a Thanksgiving menu. They are super easy – just bake the potatoes, whip the egg whites, and broil just before serving – and they capture the much-loved flavors of sweet potato casserole without as much added sugar or fat. Whatever you’re serving tomorrow, I hope that all of you have a lovely, relaxing, and delicious Thanksgiving! Ours will be small and non-traditional this year – we’re having steak tips and stuffing and raspberry pie – but I’m looking forward to the long weekend, spending downtime with my family, and eating whatever turkey leftovers Trevor manages to salvage from his family’s dinner. Plus going to the movies at least twice. Have a great holiday! 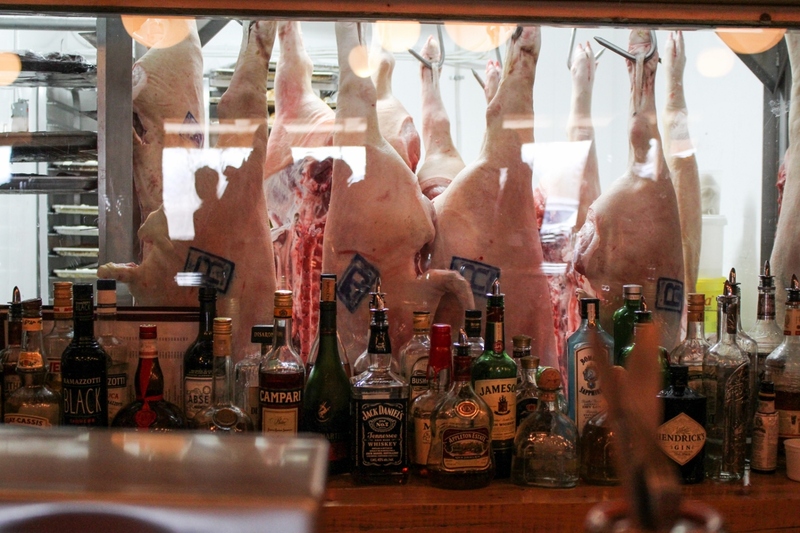 Inspired by dinner at Au Pied de Cochon. Serves 4. Preheat the oven to 375°F. Wash the potatoes and poke all over with a fork. Place on a foil-lined baking sheet and bake until tender, about 40 minutes to 1 hour depending on the size of the potato. Flip the potatoes halfway through, at about 25 minutes. Remove the potatoes from the oven and let cool slightly. Cut a lengthwise slit into the tops of the potatoes, and scoop out a small amount of the potato flesh so that there is a shallow, circular hollow on top of each potato. To prepare the meringue, beat the egg whites and the cream of tartar on high until soft peaks form. Set whites aside. Place the maple syrup in a small saucepan, and heat over medium heat until just simmering and the temperature is 235°F. While beating the egg whites on high, slowly drizzle the hot maple syrup into the whites, until the meringue is shiny and holds stiff peaks. 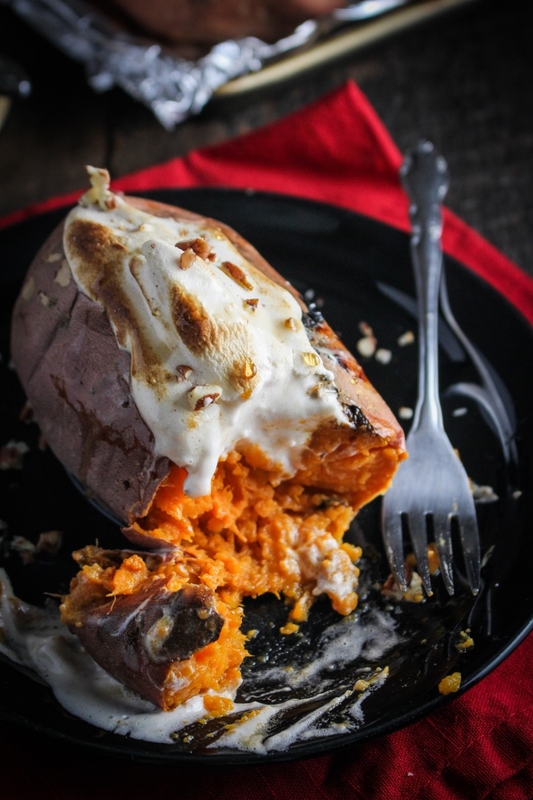 Spoon or pipe the meringue on top of the sweet potatoes. Broil on high until meringue is golden brown, about 3-5 minutes, or use a pastry torch to cook the meringue only. Serve immediately.